Senior Connor Doyle runs the Augmented Reality/Virtual Reality studio at the Harvard Innovation Lab in Allston. Great art and literature seek to move people’s emotions and thoughts, though often from a distance. But what if people could experience the intellectual and sensory grandeur of Michelangelo’s painting in the Sistine Chapel, or feel the intensity of actors in Shakespeare’s “King Lear” without having to leave their home or classroom? Connor Doyle ’19, an English literature concentrator, knew he loved the electricity and communal experience of the theater. His passion for that led him to work as a child actor, appearing in television commercials and performing on stage in his native England. In his early teens he starred in the musical “Billy Elliot,” playing the title character’s best friend in London’s West End. After arriving at Harvard, Doyle was eager to share his love of the theater with anyone else who had an interest, but he wasn’t sure how best to do so. As a first-year College student, Doyle had heard about the rapid advances in virtual reality and decided to check out the emerging technology during a showcase event in Boston, where he tried on his first proper headset. “It blew my mind immediately,” he said. From there, Doyle set about trying to find a way to develop experiences that harness AR/VR technology to the visceral, human qualities of theater performance and dramatic storytelling. “I learned a lot very quickly about the limitations of this medium for storytelling, but also the power of it to transport people,” he said. Doyle hopes to convince skeptics that, though the technology is still new, AR/VR has the potential for transformative educational, cultural, and civic projects. Since then, Doyle has been experimenting with AR/VR on his own, working on projects with fellow Harvard students and zealously spreading the word about the opportunities the studio offers. He is hoping to convince skeptics that, though the technology is still new, AR/VR has the potential for transformative educational, cultural, and civic projects, and to show that it’s for much more than playing “next-level” video games, which is how headset manufacturers have marketed it. “Why I think the studio is so exciting is that augmented reality and virtual reality are new ways of seeing the world,” said Doyle. Doyle sees the studio as a space for people probing the deep implications of these emerging mediums and for determining how this rapidly evolving technology can be integrated into daily life. The nascent field also functions as a playground where students can just experience and experiment. “People should know about this!” he said. The AR/VR Studio is free and open to full-time, degree-track Harvard students, who can investigate the latest headsets and game applications. They also can film using AR/VR cameras, create 3-D modeling and game engine interactivity, or learn how to build them by working with the three teaching assistants on hand. Periodic workshops teach basic coding and how to find resources and build applications. Doyle said taking advantage of the studio’s possibilities doesn’t require creative flair or STEM expertise — just “come with ideas,” he urged. Students from across the University have done just that. A Graduate School of Education student used VR for a project to help educate prison populations. A student at the Law School created an AR overlay for legal documents so that people could understand key legal terms without the help of an attorney. A Divinity School student developed a project that allows users to take a “virtual pilgrimage” through the Vatican. 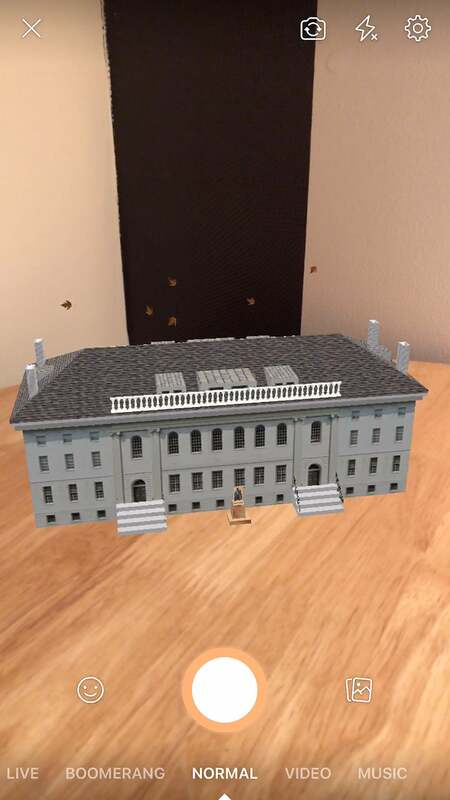 Using the Augmented Reality/Virtual Reality Studio, Connor Doyle created an app to explore University Hall and the John Harvard Statue. Click on the link below and log in to Facebook to try it. To try the Facebook Camera Effect on your own phone, use your rear-facing camera to make University Hall and the John Harvard Statue appear on a surface. If you are on a desktop or laptop device, visit this link to send a notification to your phone. The Graduate Commons Program is taking its "Meet the Scholar" speaker series to the top floor of the Smith Campus Center. The series kicks off Feb. 20 with Harvard Business School Professor Anita Elberse.